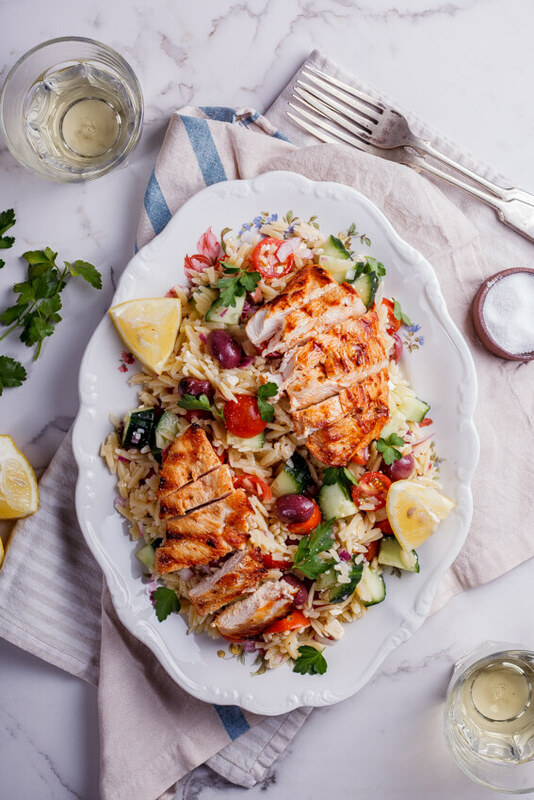 This Greek orzo salad topped with succulent grilled chicken is a fantastic recipe for an easy lunch or light dinner and makes an excellent packed lunch. I have something to confess. I have eaten this Greek orzo salad every day this week. And I don’t think I’m going to stop anytime soon. 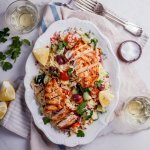 You see, I made the orzo salad on Sunday for a casual, easy lunch and made a little (A LOT) too much and have been feasting on the leftovers all week. 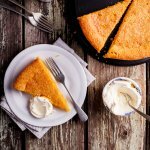 Don’t you just love super simple recipes that are so darn-gosh-delicious you could eat it everyday? I certainly do. And this recipe has made my week so fuss-free because here’s something you might not have known about me: I HATE LUNCH. I hate having to think of lunch, I hate that I have to make lunch, I just despise the whole thing. I wish I didn’t get hungry over lunch so I didn’t even have to think about it but unfortunately, come 12pm I am hit with a dose of Hangry that would scare the living daylights out of you. Thus, I have resorted to making big batch salads filled with vegetables and grains/pasta that I can make once or twice a week and eat for lunch without any effort on my part. 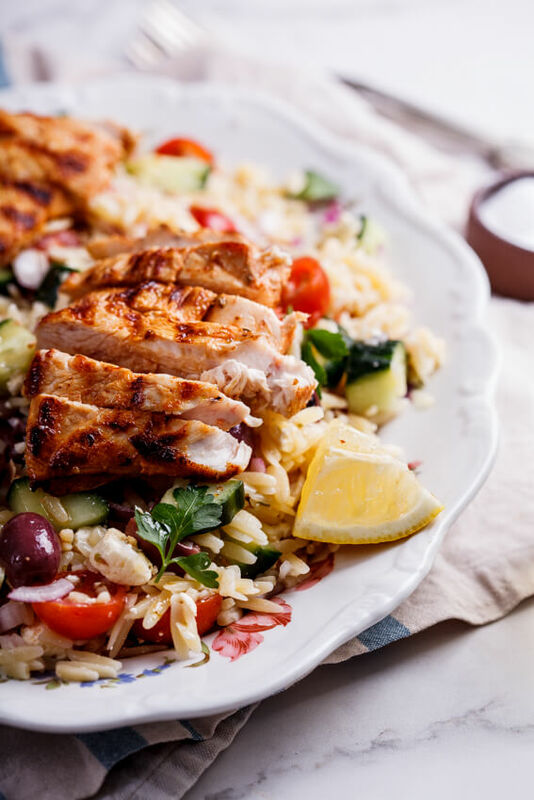 Anyway, lunch-hatred aside, this salad is just a great stand-by and topped with the juicy grilled chicken makes an awesome lunch or light dinner. You could of course keep things vegetarian and leave out the chicken and you could add some chick peas for extra fiber. But whatever you do, make enough so that you can have some for lunch the next day (and the next and the next) because the longer this salad sits, the more delicious it gets. Now if you’ll excuse me, I think there might still be some left in the fridge and I think I could do with some Greek-inspired deliciousness. Halve the chicken horizontally so you are left with two thin chicken breasts. Repeat with the remaining chicken breasts. Mix together the olive oil, lemon juice, oregano, paprika, salt and pepper then pour over the chicken breasts and allow to marinate for 10 minutes while you heat a griddle pan. 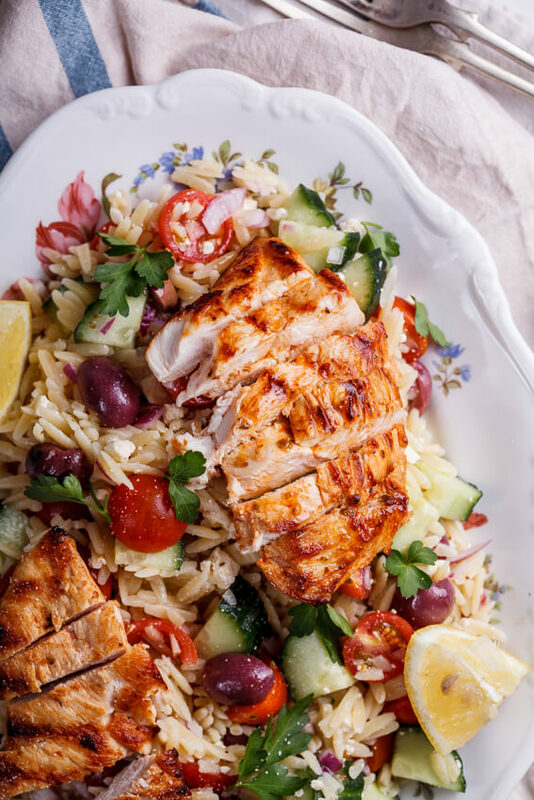 To make the Greek orzo salad, combine all the ingredients and mix well. 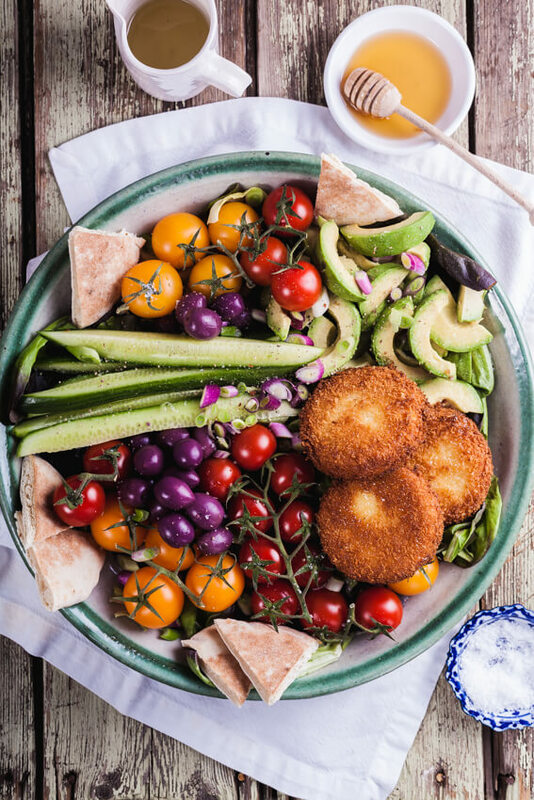 Mix together the dressing ingredients and pour over the salad, mix and allow to stand for 10-15 minutes. 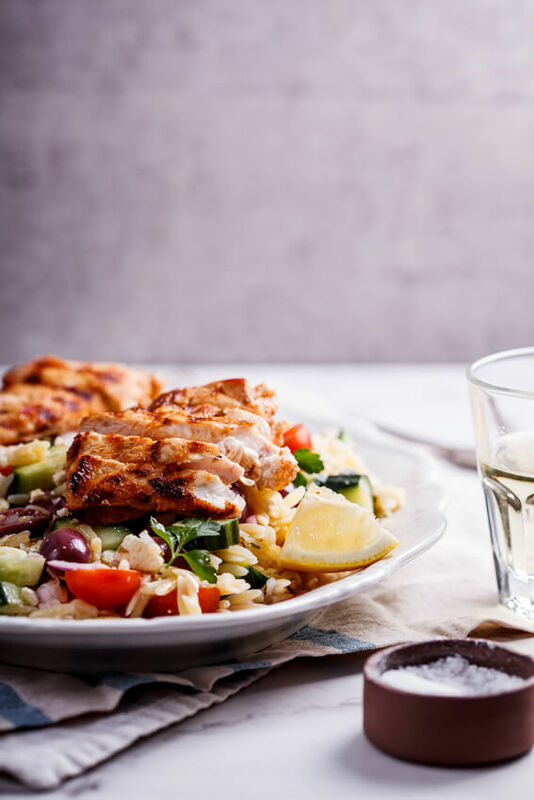 Cook the marinated chicken in a hot griddle pan until cooked through then remove and allow to rest for 5-10 minutes before slicing and serving with the Greek orzo salad. Saw this recipe on Pinterest and immediately saved it. Made it over the weekend and couldn’t get enough. Already prepped it for lunches for the week ahead. Two thumbs up! Oh yay! Makes for the BEST make-ahead lunches! I loved this. The chicken was so juicy and I’ve never orzo in a salad. So delicious. I am SO glad you loved it, it’s one of my favs! This would be an ideal midweek meal in my house! It really is. 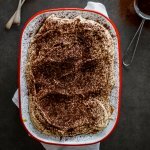 Quick and easy and absolutely delicious. That is so funny! I agree that it’s a hassle to even have to think about lunch and love it when I have leftovers in the fridge. Otherwise I eat turkey and cheese roll ups while standing at the counter. This would be waaay better than that. Oh no! Lunch is my favorite! And I guarantee this salad will be making an appearance for lunch at my house very soon! Looks so delicious Alida! I think the fact that I have two small kids who I HAVE to provide lunch for doesn’t help. I love going out for lunch or buying it in but I find it such a schlep to have to whip something up every afternoon.